This year, Anthony has teamed up with his good friend Willis Eschenbach, who says that Anthony couldn't tell good science from pseudo - not even if he had a year to cogitate. Willis discovered earlier this year that as the world warms, there's more water vapour in the air. It took him twenty years, but he found a data set from RSS that he "analysed". I've already written about that so I won't go over it again. From the “Kos kids will be Kos kids” department. Willis points me to this Daily Kos article which is hilarious, because obviously the anonymous coward that wrote it somebody who calls themselves “ClimateDenierRoundup” hasn’t got a clue about how real science works, and thinks the angry old hermit in Mt. Beauty, Australia (Sou/Hotwhopper aka Miriam O’Brien) has already “debunked” what we are going to present. Here is a screencap of the article. What “ClimateDenierRoundup” doesn’t seem to understand, is that anyone who passes the AGU selection committee criteria for sessions can present a paper, talk, or poster about science. They don’t ask for credentials, they are only interested in the arguments being made, how they are presented, and if they have merit. This means that anonymous cowards and angry old hermits can even send a paper in for consideration. Oh, wait, they’d have to use their names, and that is the one firm requirement AGU has for submissions. Obviously, that’s why you don’t see these rant-o-matic types that shoot from the shadows presenting at science conferences. Maybe, maybe not. They do write comments in Nature Climate Change and articles at Medium.com. ...it's extraordinarily rare for an AGU abstract to be rejected. I've never heard of it happening in 20+ years of attending and organizing sessions. Policy is clear: "Conveners do not have the authority to reject an abstract." In the past there have been some odd poster sessions at AGU Fall Meetings. Most of the comments so far have been about grammar - me or I. This was followed by a desperate plea from Duncan whose son was shown the film "Before the Flood" and wants to know how to stop schools from teaching children science. While joelobryan falls for and promotes one of the wackiest satanic conspiracy theories that are floating about the darker corners of the web. He's not been corrected, needless to say. You started it, naming Mann etc. etc. You will be watching, etc. etc. This is a scientific meeting, like it or not. Present what you have to present. I will donate again now. But please behave as serious researcher. Get there and present your work. I wouldn’t mind betting Miriam has not had a hot whopper in a long time but probably gets a thrill every time she writes those words. I'd guess that Greg thinks that Trump's boasts about sexual assault is just how all blokes behave. 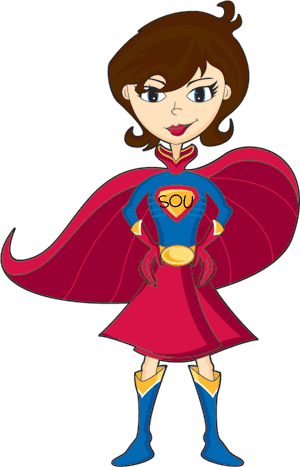 "speculation once again that I'm Superwoman Sou"
Those silly deniers, once again "speculating" what science in fact has integrated into the consensus for years if not centuries. My memory may be wrong here, but at one point wasn't Tony boasting that the AGU had accepted his poster and implying they recognized it as good science? Now he's saying any crank can submit a poster---which adequately explains why his first poster was accepted. By the way, if anyone would like to send me to the AGU I'll give a full report, post pictures, etc. It'd be cheap to send me...this year I'm just a short hop away, I'm used to living in field houses so even a cheap hotel is an upgrade, I've been biking up mountainsides all summer so could easily bike to the conference from a great distance (no transportation costs aside from buying a cheap bike which I could then sell at the end of the meeting). Even food would be cheap because I can live on oatmeal and rehydrated beans/lentils/veggies for a while. Hm, I've nearly convinced myself I should go now. Always wanted to go. I know someone who visits the city often so she knows places to stay, I'm pretty much next door for a couple of months, everything seems to be falling into place to allow it (was joking about having people give me money though...if I ever need to crowd source funds it'll be for something of utmost importance or urgency). I do not know of any abstract ever having been rejected. Having seen the bloke in the flesh, being stalked by him really is, in that timeless phrase, "like being attacked by a dead sheep". Sorry to be pedantic ashie,but it was "savaged" not" attacked". I agree with the sentiment of your post. Last year Watts attended AGU, gave a poster presentation and hinted that he was about to be published in a "well respected journal." The paper didn't appear, and was never spoken of again. I wonder what promises he will make, and break, this time?